The reason why is because they are developing schemas through schema play. If you would like to engage in conversation about the ways you can further support children’s schema play in your early learning environment, join the ECCDC’s Early Learning and Child Care Trainer Ginette Wilson for this new and engaging, interactive and fun workshop. 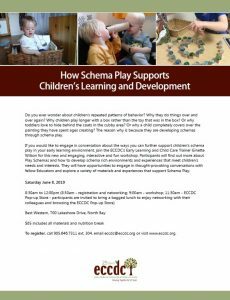 Participants will find out more about Play Schemas and how to develop schema rich environments and experiences that meet children’s needs and interests. They will have opportunities to engage in thought-provoking conversations with fellow Educators and explore a variety of materials and experiences that support Schema Play.